This has been an eventful month for the wee mister! Paddyboy started really crawling on all fours and trying to cruise his way around the room, with varying degrees of success. He's helping me put away Christmas decorations here. Thoughtful boy. If there is a loud conversation going on around him, he tries to contribute to the discussion with his "ooh, ahh, bababa, mama!" Here he is sporting his cabbage hat, while I was cooking cabbage for our belated new year's dinner. He gives his full attention to figuring out how every toy works... except when he is slapping them around and knocking them over. The boys play much differently than the girls, I've gathered. Patrick is feeding himself now. He eats everything we eat and has even started eating more than his sister. There is room for improvement on the method of delivery (hand slathering food across his little face), but I am quite proud of how receptive he is to trying new things. He is hopelessly addicted to his paci. This will be trouble later, I suspect. To balance out the spaghetti face picture, he here is, all cleaned up. If you are in the Budapest area and need a talented and patient photographer who is excellent with children, look no further than Regina Koszta of Pillango Foto. She took this and the following pictures. I love that the belly button just made it into this photo. 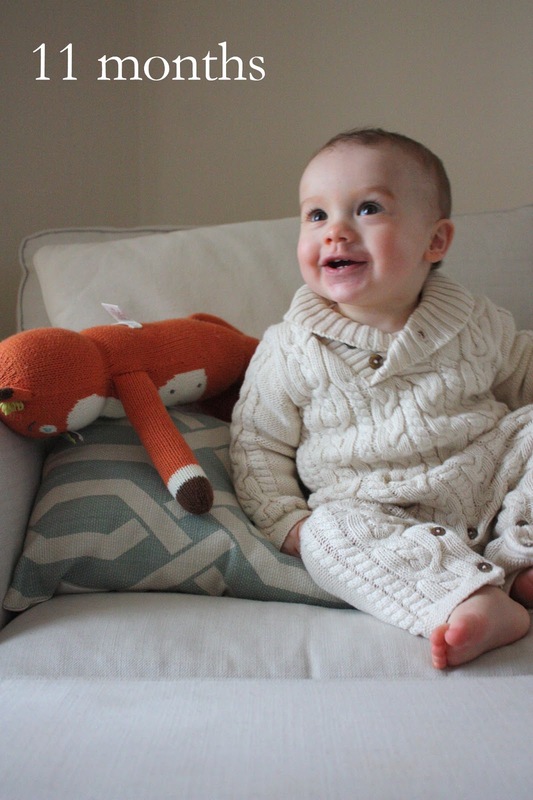 Here's to my happy, healthy, huggable little eleventh month old! So adorable! I love the baby belly. Thank for finding and following my blog also!